All of your favorite fall flavors in a classic comfort food. For the salsa: In a medium pot, over medium heat, heat olive oil. Add onions and garlic; sauté until translucent, approximately 4-6 minutes. Reserve 1/3 of onions and garlic. Add apples, sauté an additional 5 minutes. Add cumin, chili powder, salt, pepper and apple juice. Simmer until apples are tender, approximately 15 minutes. Remove from heat, transfer to a blender. Blend apple mixture, honey, cilantro, chicken broth and lime juice until smooth, reserve. For the enchiladas: In a food processor or blender, add the garbanzo beans, pumpkin, lemon juice and sage; pulse until smooth. In a medium bowl, combine reserved onions and pumpkin mixture. Season to taste with salt and pepper. 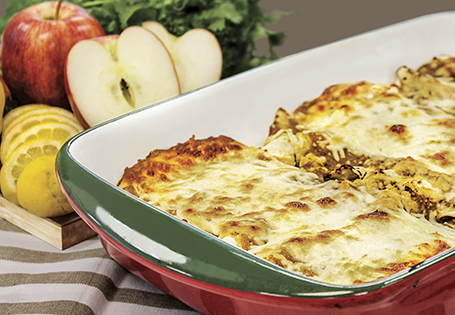 In 2 ungreased 9x13-inch pans, spread 1 1/4 cups apple salsa to coat the bottom of the pan. In a medium pan, over medium heat, warm each tortilla, 10-15 seconds per side. Evenly divide pumpkin mixture and 2 cups cheese amongst 30 tortillas, roll tightly and place side by side in baking dish. Top enchiladas with remaining salsa and 2 cups cheese. Bake until cheese is melted and lightly browned, approximately 20-25 minutes.